Not a good sign. Word was there was a fire on the train. The evening TV news and today’s Herald Sun revealed what happened: Jesse Martin, once lauded as the youngest person to sail solo around the world, had come driving up McKinnon Road (speed limit: 50 km/h), somehow missed the bells, somehow missed the flashing lights, somehow missed the boom gate in front of him, somehow missed the six carriage train crossing the road, and smashed into it, causing a small fire. Thankfully he’s physically all right. The line closed for at least half an hour. Knowing how these things can drag on, and the chaos that ensues, I didn’t hang about, I and a number of others fled for the 703 bus to Brighton to get to the Sandringham line instead, which was relatively smooth. ← Previous Previous post: So why are the trains so bad? He was probably trying to turn on the aircon in his car. For the very first time yesterday we had major disruptions on the Alamein Line. Luckily I’m at Hawthorn and so Blackburn trains were still running. It would appear though that a lot of people on the Belgrave/Lilydale don’t even know that these Blackburn trains exist. One of my colleagues was complaining about getting home to Box Hill, I asked why she just didn’t take a Blackburn. Sure it was stopping all stations but they were mostly not that crowded and the aircon was working. She didn’t even know they existed, and will be catching them from now only. Even with stopping all stations, because they don’t go through the loop they probably get there in about the same amount of time anyway. Do any other regular train travellers find the free transport today almost an insult? Most people who commute daily have weekly or longer tickets and have already validated them. At the end of the day, the regulars are the ones inconvenienced the most frequently yet we’ll get nothing for it. PS. Last night the footpath on Katandra Rd by Ormond station had buckled. Simple solution, remove all level crossings, they are deathtraps. LOL that it was Jesse Martin, how embarrassing!! Nathan, yeah people are funny. A very intelligent bloke I used to know travelled almost daily from the RMH to Richmond. Caught the tram all the way down to Flinders St, then waited specifically for a Sandringham train to Richmond. When I told him it would be quicker and less waiting to change at Melbourne Central for any of the lines through Richmond, I don’t think he believed me. Yeah they’ve announced the compensation for the month. But they had to do that, it’s in their contract. (In fact I’d say there’s a chance they’ll trigger the two dailies compensation). Note that the small print indicates Weekly ticketholders only get it if their Weekly was valid today; eg it’s really to make up for the freebie day. Well, believe it or not I was actually the first on the scene trackside , poked my head around the back of the train, saw half a car wedged between the boom gate and train, no one in it as the boy had gotten out and was being helped by others,saw a small fire between the car and trains last carriage and heaps of liquid on the ground, then rang OOO , ran to the other side of the back carriage told everyone it might be best to get out quick and me and some other bloke helped lift about 50 people of the train . A cop then ran up and told everyone to move back as the situation could have become very much worse. Kind of funny cause while we were lifting people off I saw a bit of smoke forming and actually wondered to myself at which point do I actually decide when to run but thought hey, if it blows then at least I got the train between me and the car so that would protect me. So thanks for caring and hope you had a good day at work while I was being a super hero and thanks to the other boke that was helping me. And I think Jesse Martin owes alot of people a BIG apology. Enjoy life always cuase ya never know what might happen. Wow, thanks for the first hand account. Well done on doing your bit. Still loving your blogs ! love the new picture banner ! Sure, every driver makes mistakes (I know I make my fair share, but I do try my best not to be a knob, always use my indicators, don’t park in disabled parking, etc). This guy probably couldn’t be arsed waiting for the train to pass, and blatted into it. I guess waiting for a sail boat to get you round the world must really eat away at your patience. If he wasn’t trying to get over before the train arrived, then he shouldn’t be on the roads – level crossings aren’t exactly subtle about warning you to stop (lights, alarms, signposts, a stripy reflective barrier). Imagine if you’d been crossing the road in front of him. PlatiNumEuro: that really is a simplification of the matter! 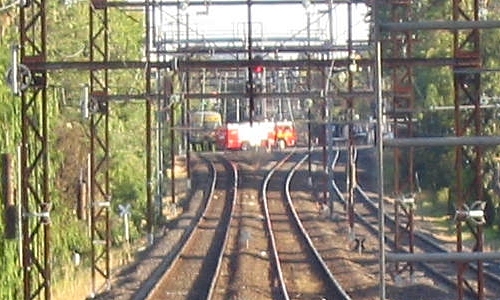 Level crossings are dangerous if you don’t obey the signals. roger: I wouldn’t call driving contrary to signals at a level crossing a “minor error in judgement” – I’d call it a bloody huge error in judgement. Just curious – has anyone suggested he did it on purpose? I don’t know the guy, but it sounds like extraordinary lengths to go to in order to save a few minutes. I like this part of the article the best ‘Thankfully he’s physically all right.’ Are you implying that mentally he is not? I guess driving headfirst into a train kinda answers that question on its own.